This poster hung on my wall in my little room back in the early nineties. I was a child so having a superhero on my wall wasn’t anything strange but something about the art decco style of this poster I absolutly loved. What I didn’t know then was that this poster deliberately echos the 30’s estetic of the times which arguably made this poster the most adult contempary peice of art in my room and made it stand out next to my Batman and Ninja Turtles movie poster. This is of course a promotional poster for the movie of the same name that came out 1991. If you are familiar with the character then come on in and make yourself at home. Chances are we would have good conventions. If not let me introduce you to Cliff Secord. He’s a little slice of nostalgic americana. He’s a stunt pilot and one day he happens to come a across new fancy gadget that can make a man fly without a plane. But the nazis want it for themselves thinking such tech could win them the war. To keep it out of the wrong hands he uses it effectively turning himself from “Joe Everyman” into someone extraordernary. This jet pack technology basically becomes his only advantage over enemies and obsticles that and his quick thinking and gung ho bravery make him the nemesis to any evil doer out there. Essentially this film is like an Indiana Jones/Iron Man hybrid and if that excites you, you should deffinetly give it a watch. The movie is based on a comic book that came out in the 80’s. 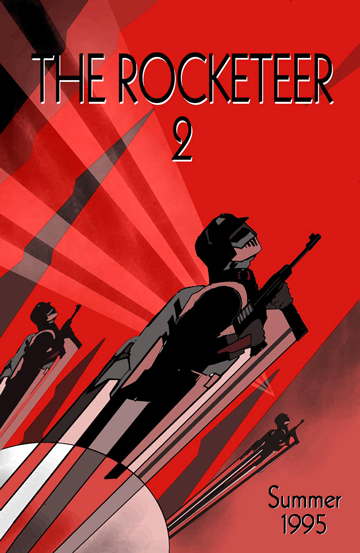 The comic it’s self was made to resemble the pulp comics of the 30’s and 40’s so it was very stylised. I knew nothing about the comicbook as a kid, I went into that theater expecting adventure and got it in full. Crazy thing is the movie still works today. It was released by Disney so somethings they toned down from the comic. Most notably Cliff’s girlfriend in the comic was Betty a actress/pinup model that was the spitting image of Bettie Page (google her and thank me later). But in the Disney movie she is Jenny an aspiring actress played by a very young and equally stunning Jennifer Connelly. The film doesn’t particularily need that aspect, it works fine without it! So imagine my supprise when I found this shot in the only comic I ever found of the hero. Needless to say my 8 year old mind was more then delighted. Anyway, where was I? The film feels like a classic. In fact I heard that the director Joe Johnston got the job directing Captain America because of this film. So there’s that. I am aware that the film didn’t exactly make the kinda dough the studio was hoping for meaning the proposed sequels were scrapped. After watching the movie again I can totally see a reboot working today. Something that feels like a “spiritual-sequel” to the original, you know reference the events of the last film a bit and not focus too much on the “origin” just keep it simple and light but up the stakes. I found this pic online and I had to share it. I don’t know if this is an actual promo or fan made but this teaser is mouthwateringly good. I just know a hit movie is in there somewhere. In closing I just wanna add that when you find an obscure jem that you love chances are there are others out there who know where you’re coming from and if you make enough noise maybe the studios and or franchise holders just might see us and give us what we want! They want to give us what we want. They wanna make money. Support your passions by letting people know what your into! If any of this sounds awesome do yourself a huge favor and give this one a watch! 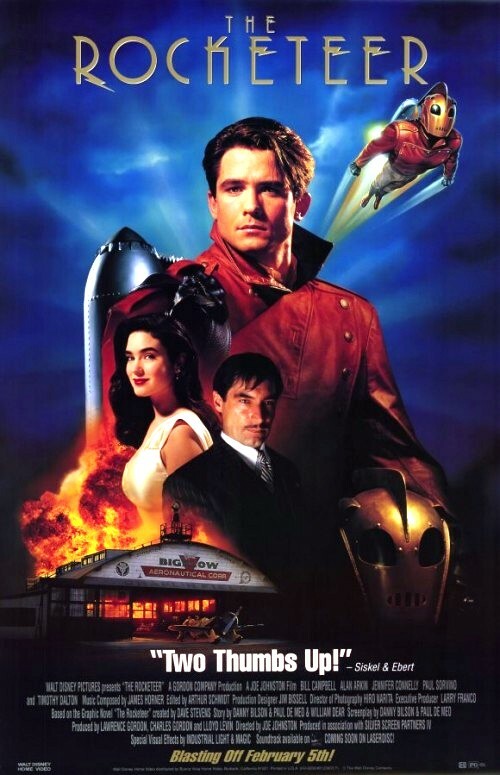 This entry was posted in Movies, Reviews, Uncategorized and tagged adventure, classic, movies, pinup, Review, The Rocketeer by illiilli. Bookmark the permalink.